In the September 7th edition of the Workers’ Comp Insider, I noticed a reference and link to a tool known as the OSHA $afety Pays Program. I find value with the process of determining how many dollars of revenue is required to pay for an injury, but have serious reservations with the tool’s calculation of indirect costs. Calculating the indirect costs of an injury is far more complex than the OSHA tool would indicate, and reliance on such a tool may erode credibility with an employer. For example, let’s look at two employees who work for a Franchised Auto Dealer that experience the exact same injury, medical costs, and lost time. One of the employees is a top notch auto technician who frequently outperforms the manufacturers allotted time for warranty work, thus generating significant profits for the dealership. This employee is difficult to replace and each day of lost time is costing the business substantial profits. The other injured employee is an auto detailer who is much easier to replace and train. Profits are not affected at the same level for the detailer as they are with the loss of a highly productive technician. So, we have the same injury, medical costs, and lost time, but dramatic differences with indirect costs to the employer. According to the OSHA tool, both would have the same indirect costs. In addition, Manuele makes a strong case to support his position on the OSHA $afety Pays program: “Data on indirect costs produced using this program is misleading. We want employers to understand and consider indirect costs. However, if employers suspects the formula to calculate indirect costs lacks credibility, they will likely question and remain skeptical on other more credible assertions and issues. Indirect costs are real. Reducing them is a critical component of effective risk management and cost control. However, the issue is complex and deserves a conversation that is not reduced to a simple multiplier. Let’s embrace the complexity and lead employers through a conversation that will enlighten and inspire. Frank Pennachio is co-founder of The WorkComp Advisory Group, a sales training and consulting organization that works with agencies to leverage technical knowledge and sales strategy into successful new business development. We posted earlier this week on draft guidelines for pain management issued by the Massachusetts Department of Industrial Accidents. While we found much to like in the draft, our colleague Peter Rousmaniere, proprietor of his own blog on immigration issues, finds that the guidelines leave much to be desired. He views them as somewhat of a mincing mini-step in an area where rather big strides are needed. Workers Comp Insider alerted us on Monday to the publication of draft chronic pain guidelines by Massachusetts DIA. Perhaps because workers comp chronic pain treatment guidelines tend to avoid some of the most pressing issues for claims payers, they are not as useful as they could be. Perhaps also because claims payers feel free to ignore them, which they regularly do, we don’t see a visible, sustained effort within the claims payer community to improve the management of chronic pain cases. One thing the guidelines have done laudably is to alert their readers to the very important patient safety issue when opioids are prescribed. This is very important: claims payers usually don’t require periodic drug tests for injured workers who have been prescribed opiates and they rarely are trained to respond when a test shows that the patient’s urine has no trace of the prescribed drug. On balance, the Massachusetts guidelines, like other chronic pain guidelines used in the workers compensation community, are rather narrowly focused to the point where their usefulness is compromised. These various guidelines focus on non-surgical treatment of patients after they reach the stage at which they can be called chronic pain cases, and before they become extended, multi-year dependents on pain medication.The proposed guidelines devote just a few summary paragraphs to a challenge of the highest importance to claims payers: knowing the specific steps physicians can take to help their extended treatment patients improve their pain experience and function. Why these gaps? I wonder if the claims community has taken the time to communicate its concerns about chronic pain, so that guideline editors might address them? I imagine that they were back at the office, unaware of guidelines being drafted, and deeply involved in the deep stack of files that welcome them every working day. An inconvenient truth for workers comp claims payers is the universal endorsement of counseling intervention. Virtually all the chronic pain guidelines share a high regard for the psychological dimension of non-cancer chronic pain, which surfaces in pain perceptions and beliefs, catastrophizing, poor locus of control, and other traits that can be both measured and altered. The guidelines recommend time-limited cognitive behavioral therapy, the kind used to help you, say, overcome your anxiety about elevators, re-injury, or perpetual pain. The Massachusetts guidelines contain within their relatively thin girth a full-throated endorsement of psychological intervention – and that’s a good thing. Unfortunately, most claims adjusters refuse to recognize the importance of cognitive therapy. They will have none of it and will deny treatment if the word “psychology” is attached to a request for treatment. The adjusters argue that once they allow psychological treatment, the workers comp courts will require them to pay for a lifetime of counseling intervention. I’ve heard this argument a lot. I wonder if the claims community and treatment guideline editors have ever had an extended discussion about psychological services and how to frame the issue to be most useful in a workers comp setting. While the proposed pain guidelines leave a lot to be desired, I believe that an effective strategy for controlling chronic pain risk is within reach. Pain management is an essential element of any cost reduction strategy. If states can begin to draft chronic pain treatment guidelines that are more prescriptive, more specific and more focused on prediction and prevention, we would take a giant step toward bringing the costs of many large comp claims under control. The following guest post was submitted by Gary Anderberg, Phd, the Practice Leader For Outcomes and Analytics at Broadspire. I was participating in a recent meeting of health, wellness, workers’ compensation and disability professionals. One of the issues on the table was information that the regs defining “Cadillac” plans may loop the cost of wellness programs, disease management and other health related productivity benefits into the total cost of the employer’s health plan for purposes of assessing penalties. If this intelligence is correct and if such provisions become effective, most large employer plans, so defined, will be subject to potentially expensive penalties, thus strongly incenting employers to relegate employee health care to the soon to be created exchanges. This question stirred up a wide ranging discussion of how to frame the value of health and productivity programs for employers. For the last several years, most of the players in this space have been using the “investment” and “ROI” model, telling employers that they will reap rewards for astute investments in employee health and productivity. As a practical matter, returns on investment have been problematic to quantify. There is broad, intuitive agreement that a healthier workforce is a good thing, but what does it drive to the bottom line? I suggested a different model — risk management. If trained, knowledgeable, productive employees are indeed a corporate asset — like trucks, buildings, airplanes, equipment, and so forth — then the health and well being of those employees presents a major risk exposure for the corporation in very immediate terms. We know that as the overall well being of a workforce declines, not only do absences of all types go up, but so do opportunity costs and the costs of poor performance and decision making. As absence rates and disability claims climb, more positions are filled by new employees with less experience and training than the absent workers. Mistakes get made, customers do not get the service they expect, and product quality suffers. I suggested that, properly viewed, health plans, chronic disease programs and all types of effective wellness programs are really risk management tools in much the same way that fleet maintenance is a risk management tool. We assume that companies will maintain their eighteen wheelers and provide safety courses for their drivers, but the health and well being of the person behind the wheel is equally critical to the company’s risk exposure when a truck is on the road. Every time a company hires a new employee, it takes on a new risk. For every employee on the payroll, from the CEO on down, there is a definite risk cost of employment which is based in large part on that person’s health and well being. So, are health, wellness and productivity programs investments with uncertain returns or are they critical risk management tools which allow the employer an important measure of control over the performance of a key asset — employees? It seems to me that these tools are vital to controlling employment costs and critical parameters of product and service delivery, especially in a world of very lean staffing and just in time management. To my mind this is not just a question of which metaphor to use. Managing risk is real and the consequences of poor risk management are often dramatic and even tragic. I wonder how many companies would consider handing over the maintenance of their critical manufacturing and distribution equipment to a government program just to save a few bucks. But how many employers may be tempted to do the same thing if the soon to be created healthcare exchanges offer a short term dollar saving? The words we use to frame decisions can carry massive consequences. If you think about the health and well being of your employees as a risk exposure to be effectively managed to minimize replacement costs and the expense of suboptimal performance and errors, what might you do differently? Think about it. Posted in Guest Posts | Comments Off on A Question of Language? In the the following guest post, Gary Anderberg, Phd, the Practice Leader For Outcomes and Analytics at Broadspire offers his thoughts on the potential impact of healthcare reform on workers comp in the coming years. Insuring the now uninsured: Positive — employees who have health insurance tend to file fewer workers compensation claims. They have less incentive to cost shift. Another result will be that chronic medical conditions will be, over time, better controlled and less likely to increase the severity of work related claims. Availability of care: Negative — with a large number of people having new health coverage, doctors and facilities may be swamped in some areas. The problem will lead to (a) delays in appointments for workers compensation-related medical treatments and (b) less willingness by providers to participate in occupational medical networks and offer discounts off fee schedules. Removing the pre-existing exclusion: Unknown — in 2014 the pre-existing exclusion will disappear in group health. This cuts several ways at once. There will be less incentive for employees to claim long standing “wear and tear” conditions as work related – a positive change. There may also be much greater demand on employers for workplace and job accommodations leading to new exposures and safety issues. Libby care: Unknown — the “Libby care” clause of HR 3590 (sec 1881A) is not intended to lead to the federalization of industrial diseases absent some very specific catastrophic circumstances comparable to those of the WR Grace disaster in Libby, MT. But we all know that ERISA was intended to address a very narrow set of union pension abuses when it was passed, but the Department of Labor, abetted by the Florida Administrators decision of the Supreme Court in 1977, expanded it greatly. The Libby care provision will bear watching. Workers compensation was not at the table when Congress hammered out its health care reform solutions. Other than a few glancing mentions, such as the Libby care clause noted above, occupational medicine was overlooked and, by default, left to the states. This is probably a good thing, on balance. Yet, as health care reform changes begin to penetrate the enormous US health care enterprise, they will impact workers compensation in many overt and subtle ways over the next several years. Carriers, third party administrators, and managed care vendors will need to be alert to capture possible advantages and avoid potential nasty surprises. Recently, I attended the 2010 Health and Productivity Forum jointly sponsored by the Integrated Benefits Institute (IBI) and the National Business Coalition on Health (NBCH) in San Antonio. I had been invited to participate in a panel discussion by Gary Anderberg, of Broadspire, who, as I have written previously, is one of the smartest people I’m fortunate to know. With me on the panel were Dan Shaughnessy, Director of Disability Programs, Textron, Inc., and Mike Machanich, Chief Executive Officer, Workers’ Comp Solutions. Gary’s charge to us was to discuss the effect of national health care reform on workers’ compensation. Thanks a bunch, Gary. But we had a stimulating discussion as we opened that colossal can of worms. I’ll write more about this in another post. One of the issues our panel tossed around was chronic pain. We’ve written about chronic pain many times over the last few years. 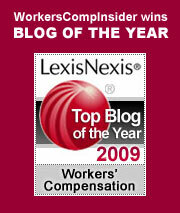 Here are links to a couple of the relevant posts:Workers Comp Drugs: Paying too much…For the Wrong Medicines! ; The Pain Conundrum. Our concern is that the treatment of chronic pain often involves what is to us a highly problematic overutilization of narcotics. So, I was a bit surprised to learn of Broadspire’s well thought out and relatively holistic approach to treating this debilitating and often times life-changing medical condition. With that in mind, I invited Broadspire’s medical team to submit a guest blog post for the Insider. Our one requirement was that it be informative to our readers, but not a self-serving advertisement for Broadspire. The company accepted our invitation, and what follows is Broadspire’s approach to the treatment of chronic pain. I’d be remiss if I didn’t add that Broadspire is not a client of Lynch Ryan’s and our publication of this guest blog post does not constitute an endorsement of the company’s products or services. Conventional treatment of chronic pain is time-consuming and often very expensive, particularly for those claims that continue without resolution over the course of several years. For this reason, it is important that employers and payers understand the dynamics and drivers of the costs associated with chronic pain. By employing a focused, multi-disciplinary clinical approach very costly segments can be targeted. It is then possible to effectively manage chronic pain from the overall costs associated with medical care and treatment as well as loss of a productive workforce. Broadspire’s Chronic Pain Program, for example, uses a defined and rigorous process. After an initial eligibility assessment, a team of specialty physicians and nurses reviews the medical and psychosocial aspects of each case. The team establishes a list set of customized strategies in the form of recommendations to ultimately achieve the goals and objectives for each case. The team then monitors the impact of interventions during subsequent meetings and follows the case through to timely resolution. Our guest blogger is colleague Peter Rousmaniere, a columnist for Risk & Insurance magazine and blogger on the immigrant workforce. Beginning with the sudden and unexpected death of actress Natasha Richardson, Peter explores the murky issue of brain injuries, where what appears to be minor may suddenly morph in to a life-threatening – indeed, life ending – catastrophe. The actress Natasha Richardson’s death was emblematic of the frightening uncertainties surrounding brain injury. She died from what appeared at the outset to be a trivial incident on the slopes of Mont Tremblant, Quebec. The NY Times reported: “Ms. Richardson, who was not wearing a helmet, had fallen during a beginner’s skiing lesson, a resort spokeswoman, Lyne Lortie, said Tuesday. “It was a normal fall; she didn’t hit anyone or anything,” Ms. Lortie said. “She didn’t show any signs of injury. She was talking and she seemed all right.” Within two days, she was dead. She joins 50,000 others who die in the U.S. each year from brain injury. Here are some lessons from this tragedy. First, brain injuries are far more frequent than we assume. One million athletes a year sustain brain injuries, the vast majority being “mild” traumatic brain injuries, or MTBI in medical jargon. Rand Corporation estimates that 19% of American troops in Iraq and Afghanistan sustain a brain injury, once again mostly MTBIs. Third, is it increasingly evident that the quality of medical and rehab care greatly matters in TBI outcomes. We in workers comp are focused, appropriately, on vocational outcomes, where the variance in return-to work outcomes for TBI survivors is much wider than it is for burn and spinal cord injury survivors. I recently interviewed TBI experts working for Paradigm Corporation, including its chief medical officer, Nathan Cope, MD. This firm’s specialty is taking over the management and financial responsibility for medical care of catastrophic work injuries. The firm’s thoughts on TBI treatment is useful because a Milliman study showed that Paradigm’s TBI patients return to work 40% of the time versus a workers comp industry average of only 8%. I asked Paradigm to explain this wide variance of outcomes in light of the Richardson tragedy. According to the company, the immediate initial care can be deemed adequate as long as the TBI is diagnosed upon initial intake. Treatment has to begin very quickly after injury. In Richardson’s situation, the symptoms began to occur a couple of hours after the incident, when the actress experienced a headache. Problems are usually indicated by a combination of two factors: physical complications (such as headaches) and behavioral (such as depression). Supervisors and managers need to look for these symptoms in any worker suffering a head injury. For the brain injured who survive the immediate aftermath of trauma, there is another layer of risk, involving low expectations for recovery: there is a cultural (and perhaps even medical) tendency to assume that once the brain is damaged, recovery automatically becomes a remote possibility. This is not necessarily the case. Unfortunately, in workers comp few managed care people really understand TBIs. For them, brain injured workers disappear into a black box, with virtually no prospect for returning to productive employment. Such pessimism is often misplaced and usually results in substantial costs to both the injured worker and the employer. Part three of a three-part guest post series on bankruptcy and workers compensation by Robert Aurbach, CEO of Uncommon Approach.. While these won’t fix every possible problem, they solve the most prominent incompatibilities between two regulatory systems while preserving the essential integrity of both. First of all, these changes only affect the self-insured or illegally uninsured employer. Since commercially insured claims continue to be paid by the insurer while the insured company is in bankruptcy, there should be no need for extra protection for such claims. Second, the pre-petition claims of the workers are still treated like all other claims. This is not likely to be a significant issue in most cases. Regulators will hear quite quickly if the self-insured employer stops paying claims, and the usual response is to revoke the self-insured status and force the company into purchasing commercial insurance ― usually at a premium from the state assigned risk pool. Since this places additional economic stress on the self-insured company, the behavior is avoided. Self-insurers rarely are as much as one week behind in their benefit payments when they file for bankruptcy. In any event, a fix that included pre-petition arrearages in post-petition claims would fly in the face of the most basic bankruptcy philosophy and likely create opposition to the proposal. Since the worker’s position is still improved from what it would be under current law, that battle is left for another day. Most importantly, the protection package fails if the self-insured employer decides, or is forced, to liquidate, instead of merely reorganizing. If that happens, the affairs of the company are concluded in an orderly way, and the assets are distributed as determined in the Bankruptcy Code ― and workers’ compensation claimants are still general unsecured creditors (the lowest priority classification). Why not give them a higher priority? The establishment of preferences for various kinds of secured claims is a sacred cow that will not be disturbed without opposition, and other claimants can be expected to seek preference for their claims as well. So what good is done under the proposal if the company eventually liquidates? During the administration of the bankruptcy estate in Chapter 11 reorganization (which is where almost all large company bankruptcies start out) the post-petition part of the claim continues to be paid. Medical treatment is not delayed, indemnity benefits are paid in a timely manner and the claim is adjudicated in the normal way. This administrative pay down will, in turn, reduce the ultimate drain on the security held by the self-insurance regulator, reducing or eliminating the ultimate call on the self-insurance guaranty fund (if any) and increasing the chances that the worker will get all the benefits that the law promised. Self-insured employers benefit. Employers are generally amenable to this proposal because they do not, as a group, appreciate the idea that one of them would walk away from workers injured in their service. Moreover, since they are the contributors to funding self-insurance guaranty funds, where such funds exist, and they are the ones compelled to place security to cover liability exposures under the current law, they have an economic stake in ensuring that all self-insured employers do the right thing by their workers. If the probability of a call on security (or a guaranty fund) is diminished, there is no need to tie up business capital funding it to ultimate reserves. That’s why the National Council of Self-Insurers recently ratified their prior endorsement of this proposal. The state benefits by avoiding the political cost of having administered a program that left workers uncompensated. It avoids the complication of the sometimes-inconsistent positions taken by state agencies in Bankruptcy Court in their efforts to collect obligations such as back taxes and environmental cleanup from the company. The state also avoids the drain caused by disabled workers ending up on public assistance rolls in the state. The proposal was endorsed by the Western Governor’s Association, the National Association of Attorneys General, and the International Association of Industrial Accident Boards and Commissions, (workers’ compensation regulators) in 2004. And Joe benefits. He may lose most of the two weeks of indemnity payments that he was owed when his Company went down, but his “post-petition” payments were restarted in time for him to keep his house. His medical dispute is resolved through a local “mediation” proceeding instead of a formal trial in another state in front of a bankruptcy judge who doesn’t know his state’s workers’ compensation law. He receives the reasonable and appropriate medical care promised by law without delay caused by the bankruptcy. The long-term medical benefits for his permanent injury should continue to be available as promised in the law ― his “post-petition” claims will not be discharged by a reorganization plan if the Company successfully reorganizes, and the pay down of his total claim will help security and guaranty funds held by the state stretch to cover him if the Company ultimately folds. Hopefully, when he is able, there’s a job for him to return to.